Can Job Applicants Outsmart Personality Tests? Many organizations use detailed competency statements to describe the skills and abilities to successfully perform specific types of work. When the core competencies for job roles are significantly different than the competencies used in available validated surveys, customized 360 feedback is the answer. Organizations also have vision and values statements. These organizations may also use 360 feedback to determine whether the values are gaining acceptance and practice in the culture. 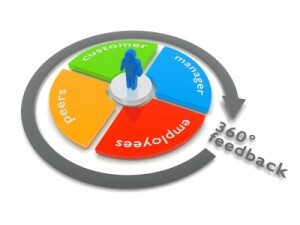 Customized 360 feedback is an excellent way to determine values alignment. HOW ARE CUSTOM 360 FEEDBACK QUESTIONNAIRES CREATED? Core competencies are translated into one or more observable behaviors. The survey designer sorts these behaviors into two categories: ones that can be trained and ones that can’t. Trainable behaviors are good candidates for the survey. If your survey is intended for development, we use only questions relating to these behaviors. Behaviors and characteristics that aren’t likely to be affected by training are typically based on personality, temperament and values. These are generally not good candidates for developmental 360 feedback, but they may have a place in other types of assessments. If you wish to measure the effectiveness of vision or value statements, they also need to be assessed by questions that reflect a behavior. High scores reflect behavior consistent with the value, low scores reflect inconsistency. Group composites, showing how well groups of employees actually “live the values” are very useful springboards for training and executive discussion. However, an organization can obtain validated items or groups of items to create a hybrid survey. For validated competencies, the Task Cycle® Surveys from The Clark Wilson Group are an excellent source. You can view these competencies by looking at the Phases and Dimensions on the product sheets for any of the titles in the Clark Wilson product line. If your organization’s competencies match part or all of these, you can capitalize on this research by adding them to your custom 360 feedback questionnaire. Also, you may wish to access questionnaire items that have norms for a similar employee population. Many core competencies are very similar across organizations and have been studied elsewhere. You may be able to obtain scales that have been validated on published surveys from Clark Wilson Group. Customized 360 feedback is generally not validated. PPI is in the unique position to provide validated items for your customized surveys, however, and bring you the best of both feedback styles. Validation can give you confidence that your 360 survey feedback focuses on issues that are genuinely important for job performance. We obtain validated items from The Clark Wilson Group’s workplace research. You can capitalize on this research and compare your results with national and international norms. WHAT IS A VALIDATED 360 FEEDBACK SURVEY? Validation is a research process that aims to show whether an instrument actually measures what it was designed to measure. It is a valuable feature in any published feedback survey. There are many types of validation studies. In the case of 360 degree feedback for training and development purposes, survey designers strive for construct validity. Construct validity is evaluated by determining how well the concepts behind the instrument account for an individual's performance on the instrument. For example, the Survey of Management Practices from the Clark Wilson Group's Task Cycle series measures the universal behaviors that are predictive of an effective manager. A manager with a strong record of success should have high scores on the survey whereas a manager whose performance has been weak should have low scores. The Task Cycle® is a validated organizing tool that can help leaders know where to focus their development. It is presented as a logical sequence of events, with each phase contributing to achieving the final goal. Task Cycle® name and image are registered trademarks of The Booth Company. © 2019 Copyright Performance Programs, Inc. All Rights Reserved.